The ideal solution and exceptional value for providing basic dental care in remote field environments. 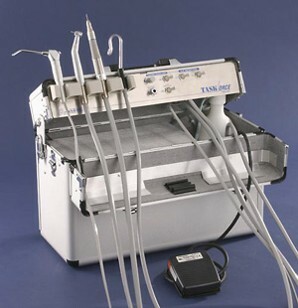 The Taskforce Deluxe adds a Cavitron connection and improved handpiece controls to the popular Taskforce system. Dual handpiece control - High and low speed. Internal high-power oiless air compressor provides over 32 psi to handpieces. One-liter water reservoir. 950 ml waste container. All system components pack into the rugged aluminum carrying case for easy transport. Case has integrated combination lock for added security. Handpieces sold separately - AHP-55 recommended.